The voice of Star Wars icon Ahsoka Tano, Ashley Eckstein, is also the brains behind Her Universe, the female-focused nerdy fashion company. Sometimes, those two sides of her life intermingle. In even rarer times, they intermingle and then get made out of Lego bricks. 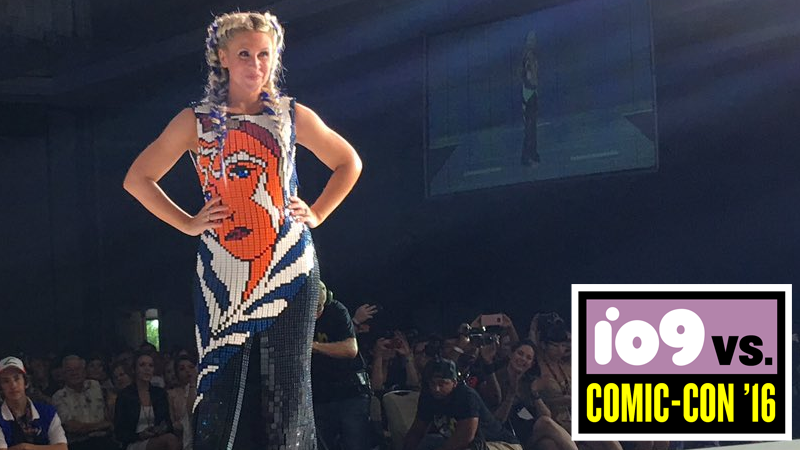 Eckstein took to the floor at the Her Universe fashion show at Comic-Con last night, and did so in dazzling style wearing what would already a pretty fabulous dress emblazoned with Ahsoka’s appearance... before you realize that the whole thing is made out of Legos. Ten thousand Lego bricks, to be precise, in a collaboration between Lego artist Nathan Sawaya and fashion designer Andrew Maclaine. Thankfully for Eckstein, the dress isn’t purely Lego, with the bricks sewn onto a regular dress. Stepping on a Lego brick is painful enough, I would imagine wearing 10,000 of them without a protective layer would also be a touch uncomfortable. Check out a few more pictures from the Her Universe fashion show below.